Before I begin this review, I feel compelled to let you know that I am not a big Call of Duty fan. I don't rush out to purchase the annual installment of the mega-popular series. Other than some Spec Ops and Zombie mode with my kids here and there, it has been almost five years since I spent any significant amount of time with any CoD game (it was to review the Wii version of World at War). So while I am not exactly a stranger to the series, I can't really compare the latest installment, Ghosts, to its predecessors, and thus will be reviewing it on its own merits. The main campaign, which is disappointingly single player only, is impressive. The plot is a bit cliche, with a mysterious alliance of South American countries who wipe the Middle East off the map and then begin to invade the good ol' USA. You take on the role of Logan Walker, a strong, silent type who is accompanied by his talkative brother, Hesh, who handles all the exposition. You may have heard a little bit about another character, canine companion Riley, the German Shepherd. The entire crew are an elite force of ultimate warriors, the titular Ghosts. The campaign is composed of hard hitting, highly cinematic moments. The first level includes a regrettably short but quite exciting scene in outer space, with unique zero-g firefighting. An aerial level puts you in the controls of an attack helicopter. 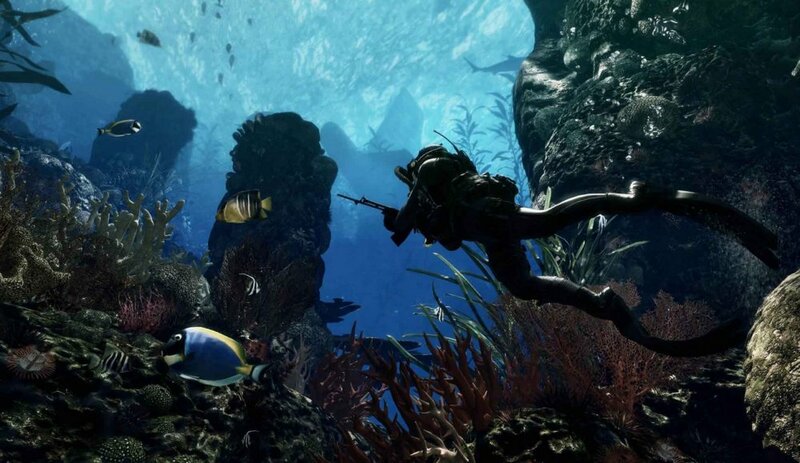 Underwater combat is another compelling twist, as is a skyscraper assault. And having Riley around, sometimes as a playable character, is pretty nifty, too. These moments are often jaw-dropping, and quite memorable. The amazing set pieces, unique environments, and puppy levels serve as a bread crumb trail to keep you interested in between the slower parts of Ghosts' campaign. There's an awful lot of repetitive, generic levels where you are simply moving from one place to another, killing lots of bad guys in between. As is increasingly (and distressingly) the case these days, the campaign is short. I would estimate the length to be somewhere in the six to eight hour range, depending on difficulty level. I recommend playing the campaign for the amazingly cool moments scattered throughout, but be warned the actual amount of content here is average at best. 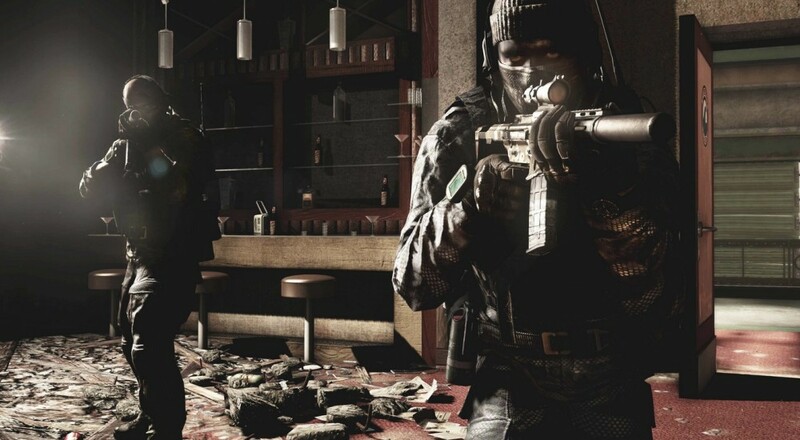 Clearly, the focus of Call of Duty: Ghosts, and really the signature of the entire series, is multiplayer. Specifically, competitive multiplayer. There's plenty of that sort of stuff here to satisfy the fans. I have little if any interest in this type of thing, and that's not really what we focus on here at Co-Optimus anyway. However, you can play most of the new play types against computer controlled bots. I dipped my foot in this a little bit, even playing online enough to gain a level or two. The multiplayer maps and game types seem well designed to my inexperienced eyes, and I appreciate the nod to the more casual gamer with the inclusion of a healthy set of vs. AI options.